Sydney (AFP) – Injured captain Mile Jedinak was Wednesday ruled out of Australia’s crunch World Cup play-offs against Syria, as coach Ange Postecoglou included a host of fresh faces in the push to make Russia. The Aston Villa star missed the Socceroos’ final qualifiers with a groin problem and was not used by club manager Steve Bruce for the Championship side’s three recent wins. His absence is a blow to Australia’s chances against the Syrians, with the first leg on October 5 in Malaysia before the return clash in Sydney five days later. Despite this, Postecoglou is confident the team will come out on top and progress to face the fourth-placed side from the CONCACAF region for a place at the 2018 World Cup. “I am confident that we have a group of players capable of achieving our goal of progressing to the next stage of qualification,” he said. Aziz Behich, Craig Goodwin, Nikita Rukavytsya and Matthew Jurman were all included in the 23-man squad, along with Josh Risdon. But the likes of Jamie Maclaren, Alex Gersbach and Ryan McGowan were missing. Australia have appeared at the last three World Cups, reaching the knockout stages in 2006 with a golden generation of stars such as Mark Viduka, Harry Kewell and Tim Cahill. The evergreen Cahill is still going strong as he looks to join an elite group of players to feature at four World Cups. 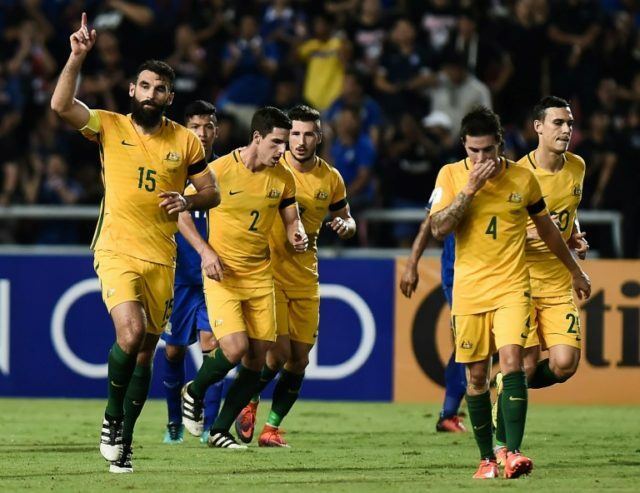 Australia: Mustafa Amini (Aarhus Gymnastikforening/DEN), Aziz Behich (Bursaspor/TUR), Tim Cahill (Melbourne City/AUS), Milos Degenek (Yokohama Marinos/JPN), Craig Goodwin (Sparta Rotterdam/NED), Jackson Irvine (Burton Albion/ENG), Tomi Juric (Luzern/SUI), Matthew Jurman (Suwon Bluewings/KOR), Robbie Kruse (Bochum/GER), Mitchell Langerak (Stuttgart/GER), Mathew Leckie (Hertha BSC/GER), Massimo Luongo (QPR/ENG), Mark Milligan (Melbourne Victory/AUS), Aaron Mooy (Huddersfield Town/ENG), Josh Risdon (Western Sydney Wanderers/AUS), Tom Rogic (Celtic/SCO), Nikita Rukavytsya (Maccabi Haifa/ISR), Mathew Ryan (Brighton and Hove Albion/ENG), Trent Sainsbury (Jiangsu Suning/CHN), Brad Smith (Bournemouth/ENG), James Troisi (Melbourne Victory/AUS), Daniel Vukovic (Genk/BEL), Bailey Wright (Bristol City/ENG).